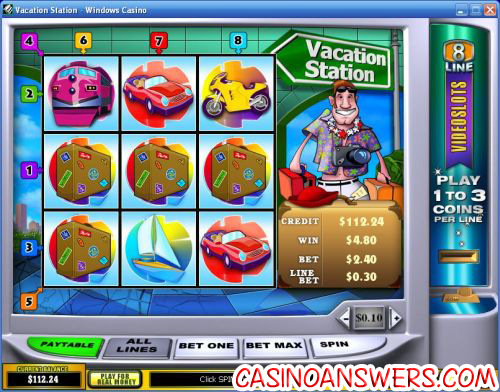 Vacation Station Video Slot Guide & Review - Casino Answers! To play Vacation Station, you can either use the default $0.10 coin value or set it to $0.01, $0.05, $0.25, $0.50, $1, $2 or $5. Once your coin value is set, you can set the number of coins per line (up to 3). 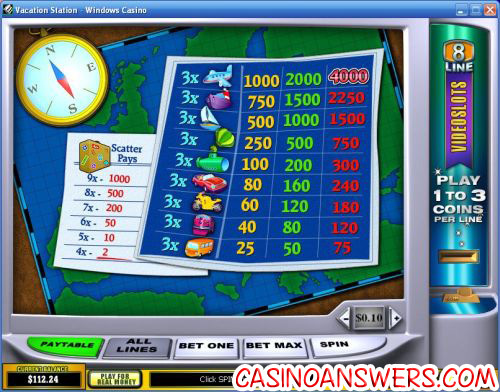 You can also set however many paylines you wish to play by clicking on the numbers on the outside of the reels. To set Vacation Station on all 8 paylines, use the “All Lines” button or use “Bet Max” to play the 3-coin maximum bet and all 8 paylines. The minimum bet on Vacation Station is $0.01 (1 coin at the $0.01 coin size on 1 payline) and the maximum bet is $120 (3 coins at the $5 coin size on all 8 paylines). Whenever you’re ready to start playing Vacation Station, use the “Spin” button to play. If you get 3 Airplane symbols on an active payline on the Vacation Station slot game, you will win its top jackpot of 4000 coins your line bet. The Ship symbol is the second highest jackpot at 2250 coins. The Scattered Luggage symbol can win you up to 1000X your total bet. Click on the “Menu” button and you will be able to open Vacation Stations’ autoplay mode. In autoplay, you can play up to 9999 autoplay spins. Click the arrow on the left of the autoplay window to expand the autoplay window into advanced mode. In advanced mode, you can set Vacation Stations’ autoplay to stop when the jackpot is won, if a single win is more than (up to $99,999), when your balance gets to (up to $99,999), stop when you lose up to $99,999 and you also set the delay between autoplay spins. You can cancel the autoplay mode at any time by hitting the “X” button to stop. There isn’t a lot in the way of 8-line slot machines around at the moment, so if you’re looking for one, we don’t think you can go wrong with Vacation Station. Deposit €97 or more at Casino Bellini, and you will receive a €103 free play bonus instantly to your account. Play Vacation Station now at Casino Bellini! I like playing Vacation Station. What other 8-line slots can I find? Of all of the casino software developers, Playtech online casinos including Casino Bellini have the best selection of 8-line slot machines. Not only do they have Vacation Station, but they also have Ultimate Fighters (our favourite), Chinese Kitchen and Gold Rally. Where can players located in the United States find a good 8-line slot? Due to the fact that USA casino players cannot play at Playtech-powered casinos, we recommend that you try signing up at the US-friendly Slotland Casino and playing the Golden8 slot game. Do I need to download any software to play the Vacation Station video slot? Casino Bellini offers the Vacation Station slot machine on their instant play casino as well as their regular downloadable casino software. If you have any problems playing the Vacation Station Flash game in your browser, make sure you have the latest version of Adobe Flash Player installed on your computer. Does the Vacation Station video slot have a progressive jackpot? Vacation Station lacks a progressive jackpot (instead it has a 4000 coin top fixed jackpot). Casino Bellini does offer an 8-line progressive slot called Gold Rally for you to try. What’s a fun summer slot machine to play?